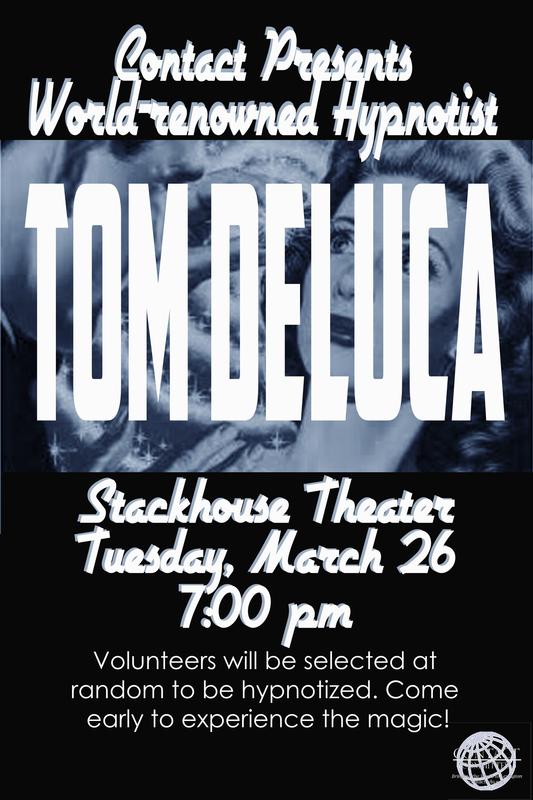 On Tuesday, March 26th at 7pm, Contact Committee is bringing famous hypnotist Tom DeLuca to W&L! Tom’s show is highly interactive, extremely funny, and will leave the audience talking about it for hours. 20 people will be selected at random from the audience to participate in parts of his performance. Contact Committee is mixing it up to bring a different kind of experience to campus. This is a fun way to see your friends do some hilarious things. This is a first come, first serve event, no tickets. Doors open at 6:30. We hope to see you there! 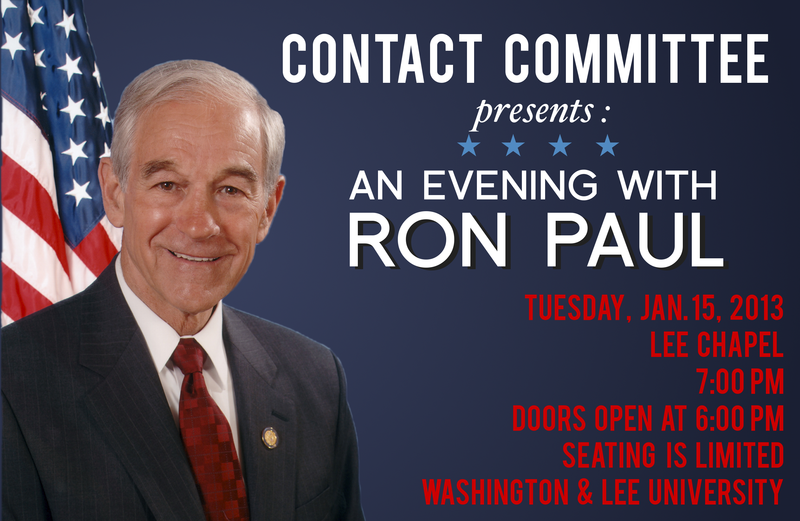 Due to overwhelming interest from the Washington and Lee University community and the general public, the CONTACT Committee event “An Evening with Ron Paul” will be a ticketed event. Lee Chapel, the venue for the speech, only has 500 seats and tickets are available but limited relative to demand. Tickets will be free and can be obtained two ways. The bulk of the tickets will be available free of charge from 9am to 3pm Monday and Tuesday January 14th and 15th in the Elrod Commons Living Room on a first-come-first-serve basis. Approximately 150 tickets will be reserved for distribution to the first people in line in front of Lee Chapel immediately prior to the opening of the Chapel. These tickets will also be free of charge. One ticket per person. As a reminder, Lee Chapel (semi-formal) attire is required for all in attendance. Former 12-term Congressman and three-time Presidential Primary Candidate Ron Paul will deliver the first speech of his 2013 College Tour on Tuesday, January 15 at 7 PM in Lee Chapel at Washington and Lee University. Doors open at 6 PM. The event is free and open to the public. Seating is limited. Lee Chapel attire required. The event is sponsored by Contact Committee, the Washington and Lee Politics department, and the Washington and Lee College Republicans. There will be a table in the Elrod commons on Monday, January 14 and Tuesday, January 15 from 10 AM to 2 PM. Stop by to learn more about the event, for free Contact Committee gear, and for a chance to win free VIP seating. Congressman Ron Paul of Texas enjoys a national reputation as the premier advocate for liberty in politics today. Dr. Paul is the leading spokesman for limited constitutional government, low taxes, free markets, and a return to sound monetary policies based on commodity-backed currency. He is known among both his colleagues in Congress and his constituents for his consistent voting record in the House of Representatives: Dr. Paul never votes for legislation unless the proposed measure is expressly authorized by the Constitution. In the words of former Treasury Secretary William Simon, Dr. Paul is the “one exception to the Gang of 535” on Capitol Hill. At the podium, Dr. Paul delivers a candid look at the dysfunctional American political system. Using anecdotes from his 23 years in Congress, he highlights the need for a limited government and more personal liberties. Dr. Paul captures audiences’ attention by relating the occurrence of current national issues such as debt, privacy and freedom to the government’s neglect to follow the constitution. Despite the less than ideal condition of the country, Dr. Paul is an optimist. His unwavering passion leaves audiences motivated to speak out, wake up and let politicians know what they want. 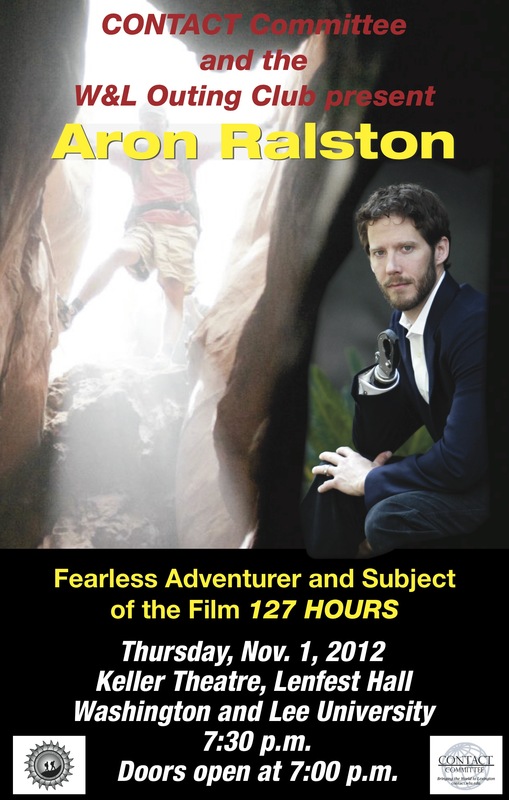 Aron Ralston, the real-life story behind the movie 127 Hours, will speak at Keller Theater in Lenfest Hall on Thursday, November 1 at 7:30 PM. Doors open at 7. The talk is free and open to the public. The event is sponsored by Contact Committee and the Washington and Lee Outing Club. Following the talk, there will be a light reception at Kamen Gallery in Lenfest Hall. An experienced climber and avid outdoorsman, Ralston was descending a remote Utah canyon alone when an 800-pound boulder broke loose, crushing his right hand and pinning him against the canyon wall. After nearly five days — without water and with no hope of escape — Ralston made a life-or-death decision. He chose life by severing his arm below the elbow, rappelling a 65-foot cliff out of the canyon, and trekking seven miles to find his would-be rescuers. Ralston documented his life-altering experience in the New York Times best-selling memoir, Between a Rock and a Hard Place, which has been adapted for the big screen by Danny Boyle, the Academy Award-winning director of Slumdog Millionaire. The film stars James Franco as Ralston, and his performance, as well as the movie, have been nominated for numerous awards. As an inspirational speaker, Aron Ralston moves audiences with his unforgettable story. An ordinary man pushed to the limits, Ralston demonstrates the human capacity for the extraordinary. He takes you on a riveting journey in which courage, perseverance, and human will defy the inevitable outcome. While Monday’s even with Mayor Rudy Giuliani is free and open to the public, seating is limited and a ticket will be required for entry to the event. 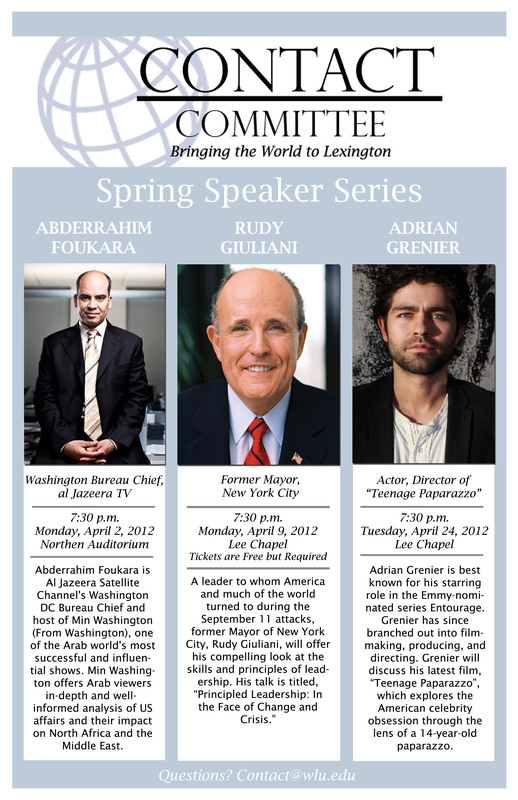 Tickets for Mayor Giuliani’s lecture will be available from 10:00 a.m. – 2:00 p.m. on Wednesday, April 4 through Friday, April 6 in the Washington and Lee University Elrod Commons Living Room. Tickets are free. Students are restricted to one ticket per person. All tickets must be picked up during the scheduled times. Do not lose your ticket. You will not be granted admittance if you do not have a ticket. Doors open at 6:45 p.m. Ticket holders will need to be seated by 7:15 p.m. at which time whatever seating is left, if any, will become available. We hope you’ll join us for an exciting April.